Email marketing is one of the most potent promotional tactics available to online retailers when, in fact, those merchants have customers to send emails to. Email can boost site traffic, drive conversions, and help build strong relationships with shoppers. The hard part is getting those shoppers to subscribe to your email list in the first place. In this article you’ll find four tips for encouraging email subscriptions. These tips can be applied to campaign-specific landing pages or to general newsletter subscription forms. As with nearly everything in online marketing, these are not exact instructions, but principles with which to experiment. In the case of email subscription forms, knowing your audience does not require a detailed understanding of Maslow’s hierarchy of needs. You also do not need advanced demographic models, necessarily. Rather, the important thing to understand is why a shopper may or may not wish to engage with your business. If, for example, you sell products that are available at many retailers, price and convenience may be important. If you sell one-of-a-kind products, like handmade or designer clothing that is only available from your store, there will likely be very different customer motives and barriers. In their book, Online Marketing Inside Out, Brandon Eley and Shayne Tilley suggest surveying potential customers to learn basic buying motives. So consider just asking some of your customers. Once you have an understanding of why a potential customer might want to engage with your business, you need to decide how to communicate your email’s value. That is, you need to know what you want to say. If, for example, your business sells fashion clothing, it may be the case that your audience likes to keep up to date with the latest fashion trends. Thus you could offer to keep them posted about new and exciting products. This tact is exactly what the online boutique Style & Conscience takes for its standard email subscription form. Style & Conscience offers potential subscribers the opportunity to say informed. Having divined what motivates your customers and what you want to say to them based on those motives, be sure not to mumble. Don’t dawdle, dillydally, or stammer, get to the point. State your proposition clearly. If folks should sign up to get “exclusive” offers, say so. This is exactly what These Are Things does on its site. 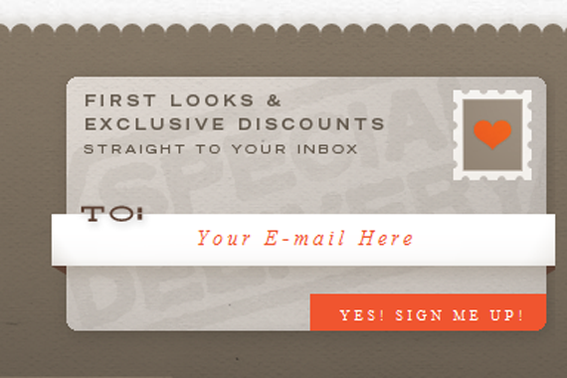 These Are Things site makes it clear that subscribers will get exclusive offers. Finally, in some cases, it may make sense to offer a reward or incentive. I have seen retailers get thousands of new email subscriptions by offering a marketing “bribe” in exchange for the registration. This reward encourages the shopper to try out the email subscription. 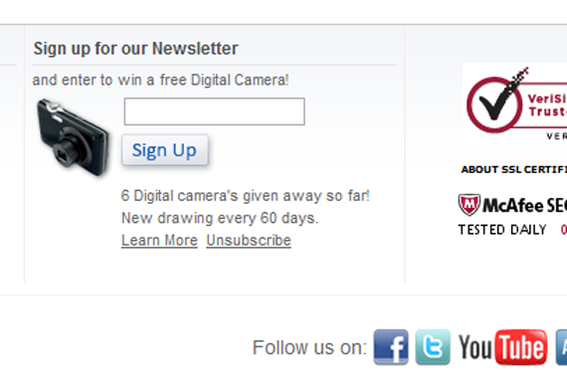 Abe’s of Maine, as an example, is currently offering subscribers a chance to win a digital camera when they subscribe. Abe’s of Maine gives away digital cameras to boost newsletter subscriptions. To encourage more email subscriptions on your standard email newsletter form or on campaign landing pages, consider (1) what motivates your potential subscribers; (2) decide what you want to communicate in light of those motives; (3) clearly and concisely state your message; (4) and consider rewarding subscribers for signing up. Once a marketer has an established list, email marketing is a powerful tool for driving site traffic and boosting sales.